The subject of war was one that fascinated Stanley Kubrick for much of his career. His first film, Fear and Desire (1953), was an allegorical war picture and with Dr. Strangelove (1964), he made a scathingly satirical anti-war film. Full Metal Jacket (1987) depicted war as a waking nightmare bordering on madness. It could be argued that Paths of Glory (1957) is his most straightforward take on warfare but this doesn’t make it lesser than any of Kubrick’s other war films. Much like Full Metal Jacket, Paths of Glory presents combat in the battlefield as dirty, noisy and chaotic – in other words, dehumanizing. Whereas Full Metal Jacket depicted the prelude to war and then actual warfare, Paths of Glory’s focus is primarily on warfare and then its aftermath, shown with unflinching honesty. Made early in his career, this film established Kubrick as a cinematic force to be reckoned with – a self-taught filmmaker who would go on to re-define every genre he tried his hand at. It is France, 1916 and the country is mired in World War I against Germany. It is literally a series of battles for inches with each side trying to get every bit of real estate that it can. 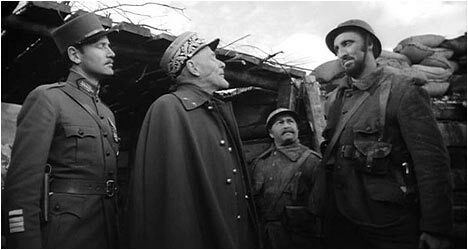 Two French generals (Menjou and Macready) debate about taking a piece of land known as the Anthill. The one wants the other’s soldiers to take it in an unrealistic amount of time but is convinced to do so anyway. Kubrick soon immerses us in the trenches and we see the appalling living conditions – mud, cramped quarters and the sounds of gunfire and bombs all around. We see the wounded and even one soldier suffering from shellshock. The soldiers, led by Colonel Dax (Douglas), are given a suicide mission: take the Anthill with no support and with severely depleted numbers with conservative losses estimated at half their forces in the ensuing battle. Kubrick’s depiction of the battleground itself is that of a desolate area of dirt decorated with large craters created by bombing. Wreckage and dead bodies litter the landscape. The battle sequence where Dax and his men attempt to take the Anthill is as harrowing and realistic as the D-Day sequence in Saving Private Ryan (1998) only with less money and many years before. Three soldiers (Meeker, Carey and Turkel) are selected from the battalion that failed to take the hill, put on trial for cowardice and sentenced to be executed by a firing squad. In the hearing, Dax defends the men against the pompous General Mireau (Macready). Kubrick does a fantastic job showing the vast disconnect between the generals and the soldiers in the trenches. It becomes readily apparent that the military leaders have no idea what is going on in the battlefield and expect the impossible from their soldiers. The director has crafted a fascinating anti-war film with a trademark intense performance from Kirk Douglas. This is an angry film that rails against the hubris and arrogance of military leadership and how disposable the average foot soldier is in their eyes. It is a theme that is sadly relevant today. Paths of Glory juxtaposes the brutality of war with the farce that is the subsequent court case with Dax as the lone voice of reason in an unfair world. Kubrick is often described as a cold and calculating filmmaker but what stands out in this film is the humanity of the three soldiers doomed to be executed for completely arbitrary reasons. Kubrick ends the film on an emotional and poignant moment that is incredibly moving and lingers long after the end credits. There is an audio commentary by film critic Gary Giddins, author of Warning Shadows: Home Alone with Classic Cinema. He points out that Kirk Douglas was at the peak of his popularity and he was responsible for getting Paths of Glory made. Giddins balances analysis with production information while also pointing out brief biographical details on key cast and crew members. He touches upon the differences between the source novel and the film. Giddins delivers an eloquent and informative track. There is a brief audio interview conducted with Stanley Kubrick from 1966 about the origins of the film. Also included is a television interview with Kirk Douglas on the popular British talk show Parkinson in February 1979. The actor speaks with his usual candor and enthusiasm, proving to be quite a lively subject. He talks about his career and, of course, Paths of Glory. There is an interview with producer James B. Harris and he talks about the film and working with Kubrick. He also speaks about how the film came together, done independently and then presented to a studio to back financially. Harris provides fascinating detail on the genesis of the film as well as various other aspects of production. Also included is an interview with Kubrick’s wife, Christiane. She talks about how meeting Kubrick for the first time and being cast in the film. She actually picked the song she sung in the film. Christiane offers her impressions on her husband’s directing style. There is an interview with Kubrick’s long-time executive producer Jan Harlan. He talks about the themes in Paths of Glory and in Kubrick’s films in general. Also included is an excerpt from a French news program about World War I French soldier Theophile Maupas whose tragic story partly inspired Kubrick’s film.